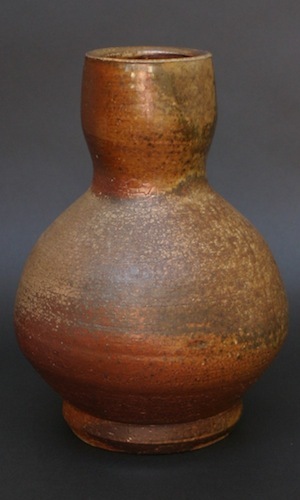 Kazegama fired jar. Photo by Kelly McLendon. 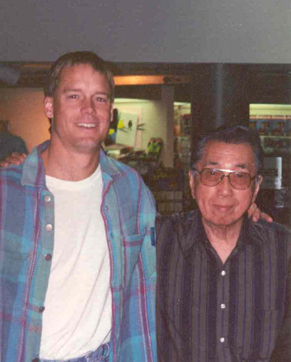 In 1997, I set out to build a gas fired kiln that would yield ceramic surfaces similar to those achieved in Japanese wood-fired kilns or Anagamas. The challenge was finding a way to deliver wood ash to the ceramic surfaces in the kiln. 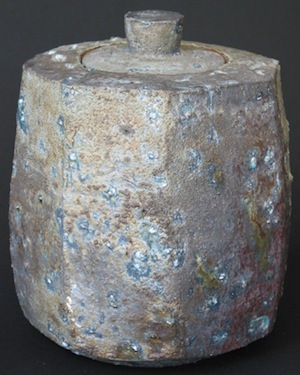 I had an old raku kiln comprised of loose soft bricks, kiln shelves, and a blower burner. With these I constructed a small test kiln similar in shape to an anagama. The kiln was fired with propane and achieved maturity after six hours. At that time, I fed a small amount of screened wood ash through the air intake of the blower burner where the ash was taken into the burner and blown onto the wares. I then heat soaked the kiln for twenty minutes. 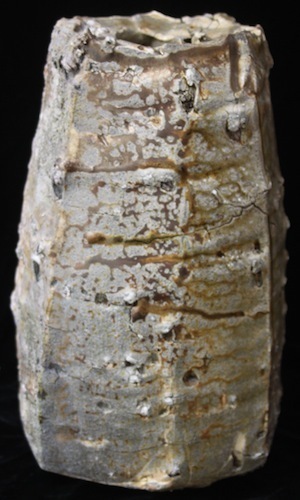 Upon opening the kiln the following morning, I found the ash had been well distributed throughout the kiln. The results showed great promise and inspired me to build several variations of the kiln. There are no firebox or charcoal bed surfaces in the traditional sense, but subtle flashings to heavy ash flows, carbon trapping, and dry, crusty, melon surfaces are achieved. The kiln usually fires for 6 hours versus the several days required for a wood firing and can be fired virtually anywhere. I named the kiln “Kazegama” after asking my step dad, Sueo Serisawa, for suggestions. Sueo Serisawa was one of the leading figures in the Los Angeles-based Modernist movement in art. 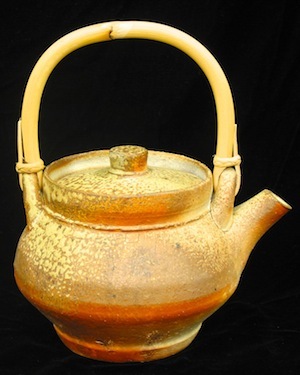 He was also acquainted with leaders of the Mingei Movement such as Dr. Soetsu Yanagi, Bernard Leach, Kanjiro Kawai, and Shoji Hamada and led tours through the six ancient kiln sites in Japan during the 1960-70s. Sueo came up with the name which translates to “wind kiln” due to the blower burners employed. “Kazegama” had a good ring to it and the word gama lent homage to the Japanese anagama. He had a strong influence on my aesthetics through his own personal work as well as the ceramics he and my mother brought back from their travels to Japan. Dr. Soetsu Yanagi, Bernard Leach, and Shoji Hamada during their visit with Sueo in Los Angeles, 1952. The kilns we fire and the types of wares we produce spring from a long history dating back many centuries. Each of us stands on the shoulders of those who have come before us. Kiln designs have changed with the introduction of new technologies, refractories, fuels, safety demands, and regulations. With all of these changes, the overriding emphasis for me is aesthetics. The Kazegama is just a tool that brings its own visual vocabulary to the ongoing tradition of the wood-fired aesthetic. Hi Steve, just wanted to thank you again for such an amazing firing in your kazegama kiln in February!! I can’t believe your step dad actually knew Dr. Soetsu Yanagi, Hamada Shoji, Bernard Leach, and Kanjiro Kawai, and lead tours to the six old kilns in Japan. I love the wood-fired aesthetics of the six old kilns of Japan (Tamba, Bizen, and Shigaraki-yaki in particular) and it’s amazing that you managed to design a kiln that accomplishes these beautiful organic ash-glaze effects in a fraction of the time an Anagama or Noborigama would take. I’m hoping to sign up for another kazegama workshop soon, but don’t see any on the Aardvark website after the one you just finished this weekend. Are there more coming in the next months? Looking forward to another workshop (tested the ribs you taught us to make and love them).